Summary of today’s show: Scot Landry and his guests discuss religious freedom, the HHS Mandate, and the conclusion of the Fortnight for Freedom. 1st segment: Scot welcomed everyone to the program and wished all a happy 4th of July. 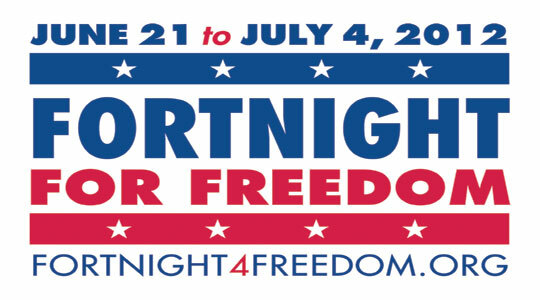 He explained that we are now at the end of the Fortnight for Freedom. To cap it off, we’ll hear addresses from Cardinal Sean O’Malley, Kim Daniels, Angela Franks, and John Garvey. Cardinal Sean opened by thanking all for listening and watching. He emphasized that today, Independence Day, we celebrate certain inalienable rights that God has given to us – one of which is our freedom of religion. The HHS Mandate the Church is fighting, Cardinal Sean continued, would violate our deepest convictions, restricting ministry and employment only to those of our own faith. Unless we work hard and speak frankly when our freedoms are threatened, Cardinal Sean said, we will lose this cherished freedom, as has happened in other parts of the world. Historically, the cardinal concluded, the USA has been a strong defender of religious freedom – we need to remember that this mandate is not a Catholic or Protestant issue, but an American issue that all citizens must speak out on. Kim Daniels echoed the Cardinal’s words, reminding listeners that American Catholics are standing up for a basic American principle. She pointed out that attempts have been made to negotiate with the administration to avoid this fight, but all failed. Now, Kim said, 43 institutions, from Catholic Colleges to soup kitchens, schools to Archdioceses, are suing to keep the government from defining what a religious ministry is. The Catholic commitment to religious freedom, Kim continued, is not a partisan issue – anyone who has listened to a dinner-table argument between Catholics knows not everyone holds exactly the same views on politics. The USCCB has always maintained that affordable healthcare is a good for society, and bi-partisan consensus used to exist on it too! If anything, Kim said, it is the Obama administration who has politicized the universal health care issue by ignoring conscience protections for Catholics, both institutionally and individually. Dr. John Garvey made three points in his address. First, he said that the legal protection of religious liberty is waning – it has slowly degraded over the years, giving protection to priests but not teachers, or religious orders but not hospitals. Catholics and Catholic organizations exist to provide every citizen with services. Catholic Charities does adoptions, Dr. Garvey continued, because the Gospel tells us to care for the weak and vulnerable. Catholic schools and colleges exist to educate because the Gospel tells us to teach all nations. But even that basic mission is under attack – Dr. Garvey said that Catholic University itself would have to pay almost $2.6 million per year in penalties should it follow Church teaching and refuse to offer contraception, sterilization, and abortion services on health plans. Lastly, Dr. Garvey emphasized that the framers of the Constitution protected religious freedom because they thought it important for human flourishing and happiness. Dr. Angela Franks opened by listing what the mainstream media says the HHS mandate is about – a “Catholic war on women,” contraception, the Church “imposing values” – none of this is true, Angela affirms. The issue cannot be contraception, Angela argues, because it is already ubiquitous and cheap; any woman who can afford a few lattes a month can buy birth control. The issue is not the Church forcing people to do anything, Dr. Franks continued, but rather about the government trying to force a policy of secularization on the Church. The biggest lie, Angela concluded, is that the Church is waging a war on women or is anti-woman. As a woman, she said, it offends her that Speaker Pelosi, SEcretary Sebelius, organizations like NOW or Planned Parenthood, or even the President should think they speak for all women. Angela mentioned a petition initiative about this point, located at WomenSpeakForThemselves.com. 2nd Segment Scot welcomed everyone back and explained that the second half of the show would be a reading of the USCCB document “Our First Most Cherished Liberty.” You can access the full text at this link. For Scot Landry, our Producer Rick Heil, and our team of Dom Bettinelli, Karla Goncalves, and George Martell, happy Independence Day!